For those who don't know, this is a brand owned by Walmart. I decided to give this one a try because a) it has no sugar, b) I love trying new things and c) I want to encourage Walmart to keep on making affordable organic food. I'm hoping it will help people (who think they can't afford organic) get into organics. Overall the cereal is ok. 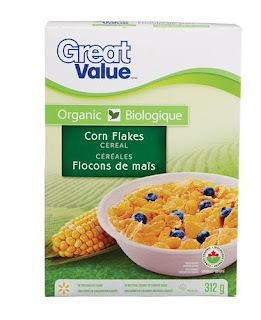 I think it's a good transition for those who already eat normal corn flakes. It tastes just like the non-organic corn flakes. But if you are spoiled like me and have been eating only whole grains for 2 years, I'm pretty confident you will find this cereal tasteless. It is cheaper than the PC, though. So if you are tight on budget or want to try switching to organic, this could be a good option. Personally, I won't buy it again. For me, the nutritional value of the PC cereal is worth the extra money.